Sara is probably one of the most selfless and genuinely kind people I know, I love this girl. She has blogged before for us in our 30 somethings, and then here and here for the Mommy Diairies. Today, she'll be talking about her version of love. Becoming a parent really teaches you about a selfless kind of love. Children, especially young children, demand so much without always providing much, if any, gratitude in return. As children grow the parent/caregiver begins to be rewarded by the child’s affection, words of love, and maturity for all those months and years of personal sacrifice. This kind of love between a parent and child you see every day and it is beautiful and magical. There is another kind of selfless love which is not as glamorous. My maternal grandparents died suddenly in a car accident right before my 3rd birthday. 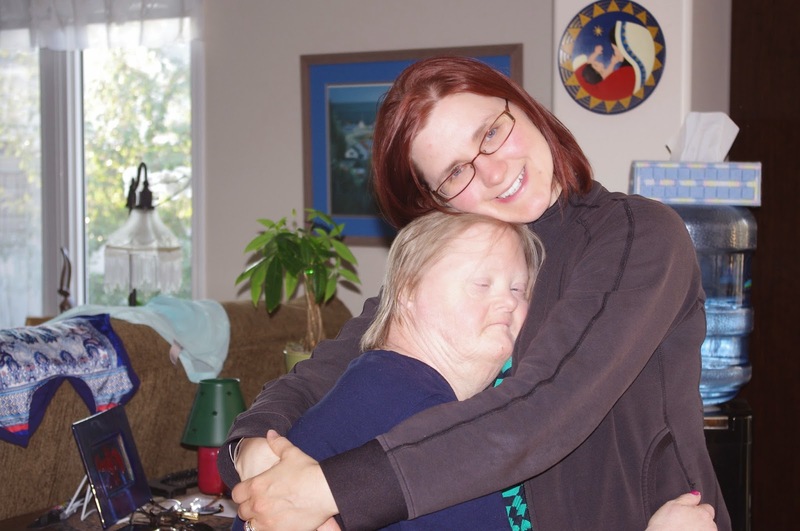 My mom is the oldest of seven children so when this tragedy occurred she and my father brought my aunt, who has Down Syndrome, back to Saskatchewan to live with us. Because I was so young at the time I have no memories of life prior to my aunt, Nan, living with us. My sister and I grew up, left home, got married and had children all the while Nan continued to live with my parents. Due to a career move my parents found themselves needing to leave Prince Albert and move to Saskatoon. My sister and her family were living in PA at the time and happened to be in a position to buy my parent’s home. This worked out perfectly for Nan as change can be hard on her, so while my parents moved to Saskatoon and got settled Nan stayed in her own home and workplace. The plan was always for Nan to move to Saskatoon eventually once my parents finished their basement and fixed up a space for Nan. Ten years passed and Nan simply settled into my sister’s family and never moved to Saskatoon. The life expectancy of individuals with Down Syndrome is 55 years and as Nan celebrated that birthday this year we have seen her quality of life diminish. She started becoming incontinent, forgetful, and lackluster. Her health started declining but with a diagnosis of diabetes the family was hopeful that she would return to her happy and cheerful self. Some things did improve for a short while but the reality is Nan only has less than a year to live. Nan has full fledged dementia. This is a horrifying condition that has Nan losing her ability to think and reason. She is now unable to recognize her family and home surroundings which leaves her in a state of constant fear and anxiety. Her mind takes her into terrifying places causing her to scream throughout the night. Heartbreaking!!!! Nan has become completely dependent on my sister (Mandi) for her self-care needs as Mandi has to bath and clean her. Nan forgets where she is and why she is there. Mandi has to remind Nan how to get to her room, and what she needs to do when she gets there. She will wander which leaves Mandi and her family in a constant state of worry that she may hurt herself or walk out the front door. The love and patience demonstrated by my sister throughout the last few years is inspiring. She, and her family, has taken on Nan’s care wholeheartedly without complain or compensation. Mandi has put many aspects of her own life on hold so that Nan can spend the end of her life surrounded by family. This is what love looks like, desiring the absolute best for the other. Giving everything you have and not expecting anything in return. I’m inspired by witnessing this kind of love. Wow, what an amazing person. Thanks for sharing! Beautifully written. Love Nan and you too Sara, and am inspired to be as kind and giving as Mandi. What a wonderful story! Thank you for sharing it with us. Thoughts and blessings to Nan, Mandi, and your entire family.